Sutton, who was born in the Greenpoint section of Brooklyn in 1901, was a bank robber and prison-escape artist. Because of his use of disguises, he was known as “The Actor.” At various times in his career, he posed as such things as a mailman, a telegraph messenger, a police officer, a window cleaner, a prison guard, and a maintenance man. After a series of robberies and a prison term for safe cracking, Sutton was sent to 30 years in Sing Sing in 1931. He got his hands on a firearm, took a guard hostage, and escaped on December 11, 1932, using a makeshift extended ladder to get over the prison wall. 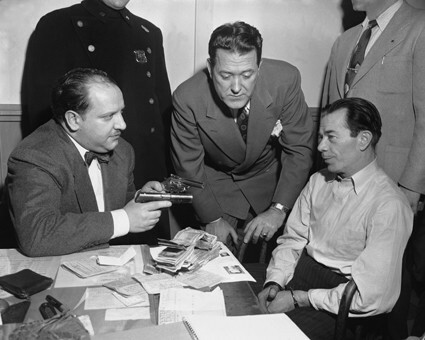 Willie Sutton, right, is questioned after his arrest in Brooklyn in 1952. He moved to Philadelphia and resumed his vocation until he was arrested again and spent about 15 years as a guest of the commonwealth. 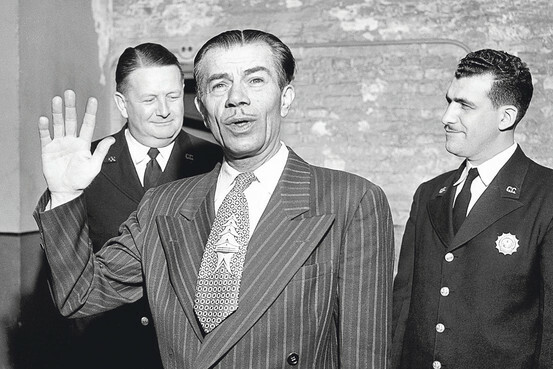 On April 3, 1945, Sutton and eleven other inmates escaped from the Eastern State Penitentiary in Philadelphia by crawling through a tunnel — Sutton’s fifth attempt to break out of this prison — but he was arrested the same day by city police. Because he was a four-time loser, Sutton was sentenced to life in prison and sent to the Philadelphia County Prison in Homesburg. On February 10, 1947, he and other inmates, dressed as prison guards, carried two ladders across the prison yard to the wall after dark. The story goes that the watchtower searchlights found the men, but Sutton yelled, “It’s okay,” and no one interfered with the escape. That escapade earned Sutton a place on the FBI’s list of ten most-wanted fugitives. Sutton already had a life sentence plus 105 years hanging over his head, but he was tried again for a bank robbery in Queens and had his lease extended another 30 years, this time at the Attica State Prison. The dapper Sutton at the Queens County Courthouse where he was tried and convicted for the final time. Because of his failing health, however, he was released on December 24, 1969. The following year, he did a television commercial promoting a new credit-card program offered by the New Britain, Connecticut, Bank and Trust Company. 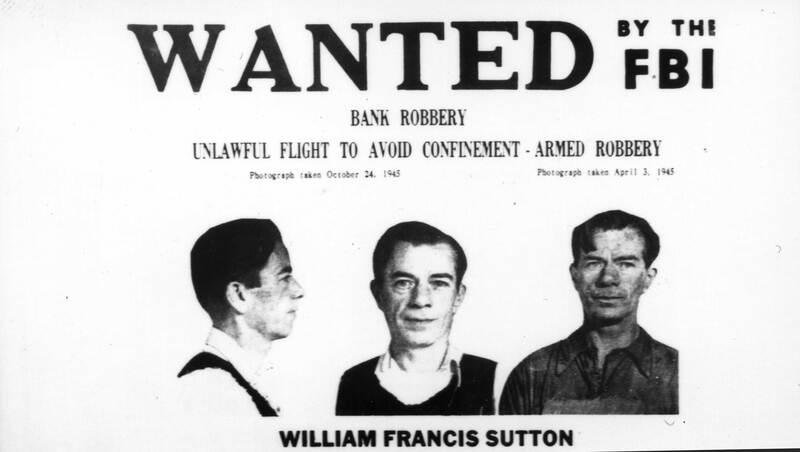 Sutton was reputed to have said, when he was asked why he robbed banks, “That’s where the money is.” Sutton, however, denied having said that although, he added, if someone had asked him that question that might have been his reply. Dear Chuck, I believe the prison where he was incarcerated was Holmesburg Prison. I remember reading about him, especially during his time in Philly, as I grew up there. He robbed the Girard Bank and Trust branch in West Philadelphia, which is where I lived. He was in both Holmesburg, which is still open, and Eastern State, which closed in the 1970s. Yes, we love Pittsburgh. We’ve been there several times. Our granddaughter Emily is going to be a junior at Pitt. 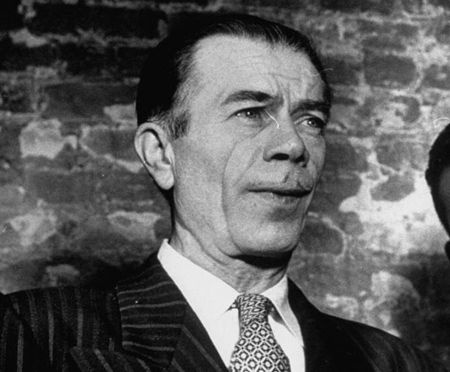 Of course I’ve heard of Willie Sutton, but not in so much detail. There’s a good bit to laugh at in the tale, not the least of which was that bank taking him on as a spokesman. On the other hand, telling the guards, “It’s ok,” and being believed, is pretty good, too. I really was interested in those comments at the end: that the thrill of the game was the point, rather than the money. It does sound like a case of adrenalin addiction: the sort of thrill-seeking behavior that impels people as widely removed as Philippe Petit and the neighborhood kid with his first hot car. This was a delightful read!